Indium Corporation will feature its metal thermal interface materials for burn-in, including Heat-Spring® and HSMF-OS, at Burn-in & Test Strategies Workshop on March 5-8 in Phoenix, Ariz.
Indium Corporation’s Heat-Spring® is designed for use in the burn-in process. It is patterned to optimize contact with non-planar surfaces and provides 86W/mK of thermal conductivity using a pressure range of only 35-100+ psi. Heat-Spring® is available in alloys including InAg, InSn and pure indium. HSMF-OS is a multi-layer construction with a total thickness of 0.004” that is designed for high insertion capability. The interface, consisting of aluminum and non-silicone polymer, has a tensile strength of approximately 90MPa with a soft, compliant polymer backing, which provides a configuration with “designed-in” insertion survivability. 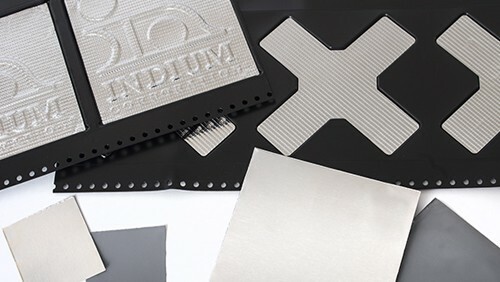 To learn more about Indium Corporation’s metal thermal interface materials for burn-in and test, visit www.indium.com/thermal-management/burn-in-and-test.